So. I’ve got three cords of firewood that have been seasoning for about a year. They are still in long tree lengths, piled like jackstraws in the yard behind the barn. I need to cut the whole business down into chunks that I can split and stack before the dark and cold really sets in. I went out to the barn to fetch ‘Ol Jen (my Stihl, .024 chainsaw) to expedite the proceedings. Unfortunately, she was not willing, and as much as I wheedled, diddled, and choked her, she simply would not start. Nothing to it but take her over to Ray’s Redeemed and Repaired Small Engine Shop for a proper tune-up. 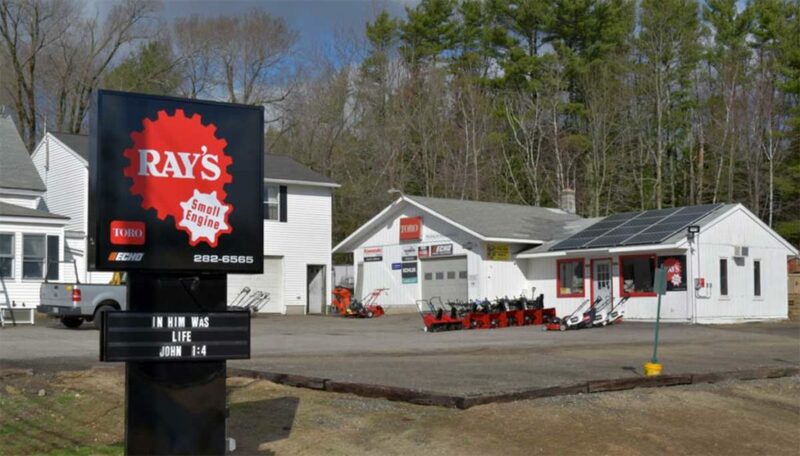 Ray’s shop is on Route 111 in Biddeford, Maine. it’s a tidy operation; the small shop and sales office tucked up against the family home, a small selection of new and reconditioned equipment on display in the parking lot; lawnmowers in the summer, snow throwers in the fall. The thing that distinguishes Ray’s Redeemed and Repaired from other small engine repair shops, however, is that there are only a few pieces of machinery out front, and everything is orderly and swept, and generally minded over. The miasma of broke stuff is sensibly hidden out back, behind a fence. His competition, little shops scattered about the back roads, are little more than burying grounds for all the little engines that couldn’t. Snow throwers and lawnmowers sit cheek and jowl, regardless of the season, sinking into the earth, unmoving, like broken promises or little jagged, rusty gravestones. The same attention to order is evident in Ray’s shop. The service areas are tidy and workmanlike; the workbenches have cubbies for tools and little magnetic bowls for disassembled parts. There is kitty litter and other prophylactic precaution available to address any fluids that might get spilt. Other small engine shops tend to resemble mechanical whore houses, parts and pieces akimbo, unidentifiable lubricants slicking every horizontal surface. The sales and office area at Ray’s is similarly buttressed against the perils of sloth and entropy. I name my tools; usually, but not exclusively, after women I have known. Usually, the function of the tool lends itself to the task. I have a lot of tools, and I’ve known a few women. This is not a bitter, hating thing; I love all the women from my past, eventually. They have all meant something to me and served different purposes at different times, so it’s sensible to draw upon those nuances in the naming of my tools; kind of like naming a fleet of battleships. It also serves a practical purpose. I can send someone to fetch a tool for me, and rather than having to describe which particular hammer or saw, I can say, “Get Ingrid” or, “We’re gonna need Katey for this job.” and my assistant will scamper off and return with exactly the tool I need for the task at hand; very practical. I have a Coleman single burner camp stove named Gracie. She’s short and squat, and reliable and sweet; just like the little old lady who worked in my cafeteria at high school. I loved Gracie, and I loved my little stove. I have many hammers, and their specific uses are perfectly suited to the nuances of women from my past. Little Anya is my finishing hammer, for the careful, delicate work we do. Maggie is my 28oz Estwing framing hammer; no-nonsense, get down to the business of pounding. Wendy, for the 5 lb. hand sledge, because she’s a dull but useful tool, and Kate is the 10 lb. blacksmith’s hammer, because she can flatten her target like a road apple squirrel. I imagine you get the idea. At any rate, I wiped “Ol Jen” down, packed her into her case, and took her down to Ray’s. He doesn’t usually service Stihls, but he told me he’d do what he could. “Stihl’s are good saws”, he declared, “but known to be contrary.” I could not argue, having had experience in that regard. He told me to check back in, in a week or so. Three weeks later, Ray called to inform me that he had finally sorted ”Ol’ Jen” out. There had been carburetor and filter issues; also a broken fuel line and tricky choke adjustment. Parts had been hard to come by, and she had displayed a “come here, go away” fickleness that was common in models of her type and vintage. Nonetheless, he’d got her working, Bless the Lord. I stepped up to the counter to pay the bill. Ray offered up much more explanation for the $110.00 bill than I required, but no matter. He has no idea the costs I’ve incurred over the years, and why should he? I’m happy to have her back; eager to get to the pile of jackstraw logs. I need to feed the stove, as it gets colder day by day. I notice, amongst the predictable clutter of pens and promotional bric-a-brac upon the service counter, a thumb-worn, little leather-bound volume of the Book of Psalms. Sitting on top of the little book was a fossil, a small trilobite. There is a conundrum here; an irony that begs a question I fear asking, as this man has fixed my tool for a reasonable price, and I have watched him dress down other pilgrims who have made light of his roadside evangelical. He gives me a slow, appraising look, and then took up the fossil in old, work-hardened hands; hands indelibly, darkly etched with oils and solvents, turns it about, peering at it over the top of his ancient bifocals. “Well” he offers, “it’s the oddest rock I’ve ever found. If you look at it just so, you can see Christ’s face looking back at you, like I seen on the Shroud of Turin, only here, he’s smiling, see?” And with that he handed the little stone to me, and indeed, for a moment I saw the face of Christ grinning back at me, from the ancient, stony shadow of a critter who scuttled across the ocean’s floor so long ago that its very existence is but a rumor. I looked up at Ray, and of course, he too was grinning at me, like a dime store Buddha. So. “Ol Jen” and I make for home. She runs like a charm, and we make short work of that pile of logs. She’s a nice piece of equipment; well-balanced in the hand, eager and responsive. One had best be careful, however. You can wipe her down, smooth the bar oil and chips from her teeth, from her sleek body, but don’t you let your guard down or underestimate her. 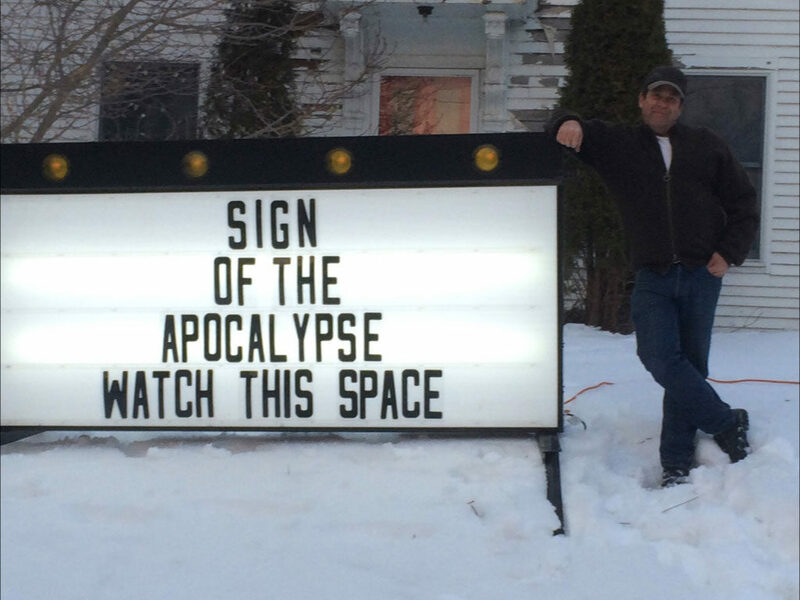 Do so only at your own peril. She can be idling along, purring like a slumbering panther, but in a flash she can turn, cut you to the very bone, and she ain’t no surgeon. She’ll leave ragged, un-mendable edges, and blood splattered everywhere, and as you run howling into the wilderness, she will shrug, your blood cooling on her steely teeth, and slouch off into the future in search of new wood.